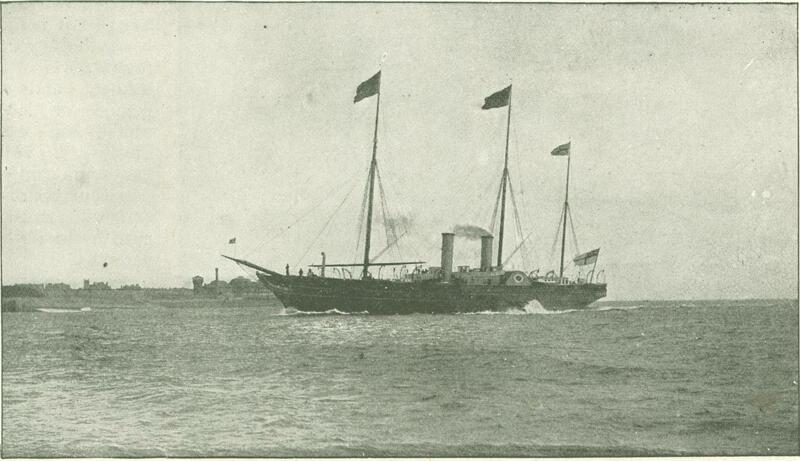 The Victoria and Albert is a paddle vessel of 2,470 tons, built by Her Majesty's Government and launched from Pembroke Dock in 1855. Her dimen­sions are: extreme length, 336ft. 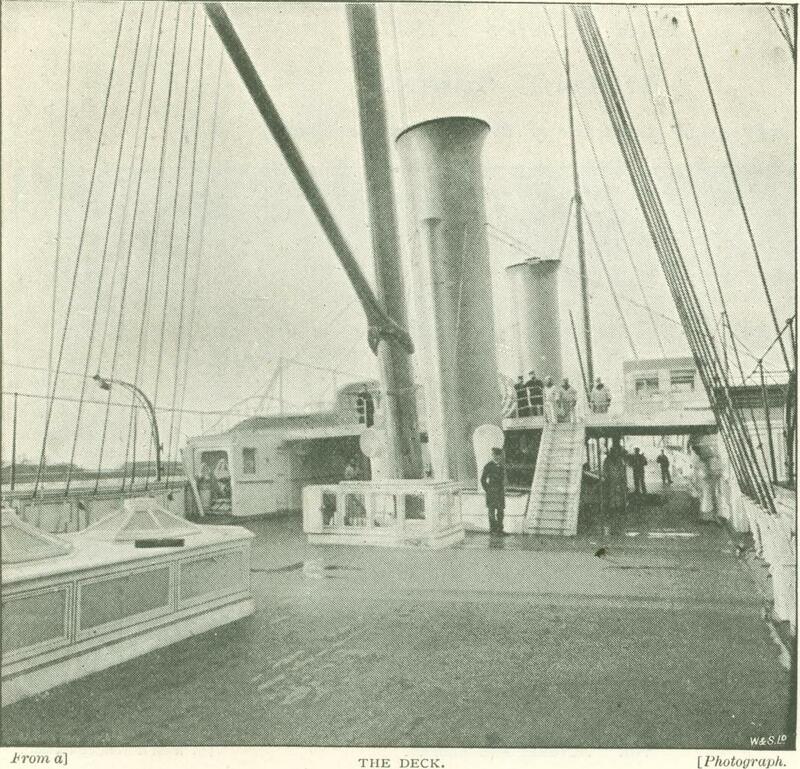 4in; breadth of deck, 40ft; displacement in tons, when deep, 2,390 tons. 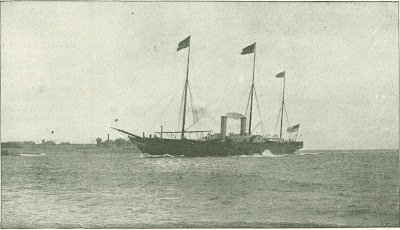 Her engines make twenty-one revolutions a minute, and are supplied by four boilers, with six furnaces to each. It takes about six tons of coal to get up steam, and about three tons an hour to keep her at full speed. Highest indicated horse-power, 2,400. 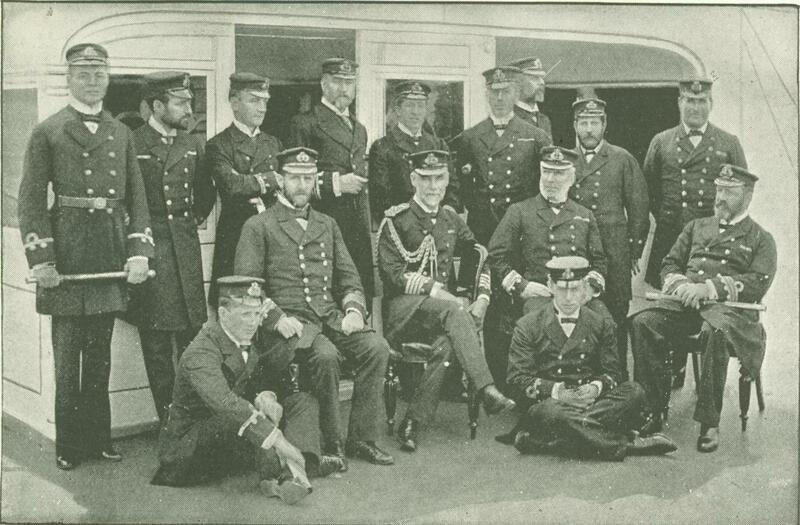 Her Majesty the Queen made her first cruise in her on July 12th, 1855. What will first strike any visitor going on board the Victoria and Albert is the utter lack of luxury and magnificence of decoration and furniture in the Royal apartments. The most perfect simplicity, combined with good taste, prevails everywhere. It would be well for those who complain of the cost of our Royal yachts to compare them with those of other nations, and note the difference. 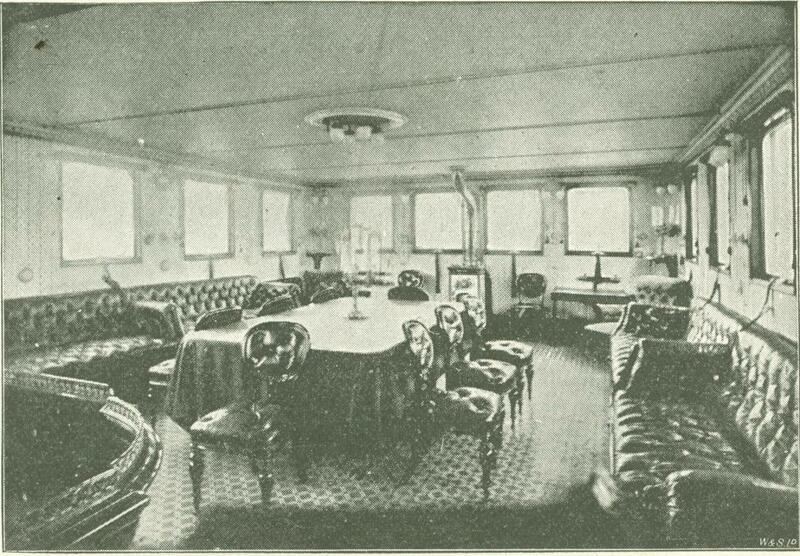 The deck is covered with linoleum, over which red carpeting is laid when the Queen is on board; and plenty of lounges and cushions laid about and many plants, which contrast pleasantly with the white and gold with which the vessel is painted. She is lit electrically throughout, having forty-two ac­cumulating cells. She carries two brass guns (six pounders) for signaling only. There is a pretty little five-o'clock-tea cabin on deck, which has a hood coming down from the doorway, as a protection from the wind. There is also a miniature armory, lamp-room, chart-room, and a number of lockers for signing-flags. All the Royal apartments have the floors covered with red and black Brussels carpet, in small coral pattern; the walls hung with rosebud chintz, box pleated; the doors of bird's-eye maple, with handles of iron, and fittings heavily electroplated. Her Majesty's bedroom has a brass bedstead screwed into sockets in the floor, bed furniture of rose­bud chintz lined with green silk, canopy to match, green silk blinds, and plain white muslin curtains with goffered frills, mahogany furniture, chintz-covered. Dressing-room: mahogany furniture, covered with green leather, writing and dressing table combined; the walls covered with maps and charts on spring rollers. The wardrobe-room, in which Her Majesty's dresser sleeps, is furnished in a similar style; and here I saw a boat cloak of blue embossed velvet, lined with scarlet cloth, and another made entirely of scarlet cloth and with the "Star" on the front, which once belonged to George IV, but is now sometimes worn by the Queen. In the Princess Royal's room - as it is still called - the furniture is of maple, an electric light pendant hangs over the toilet table, the walls are a pale salmon color, and the cornice a shell pattern in white and gold, the ceil­ing done in imita­tion of plaster. 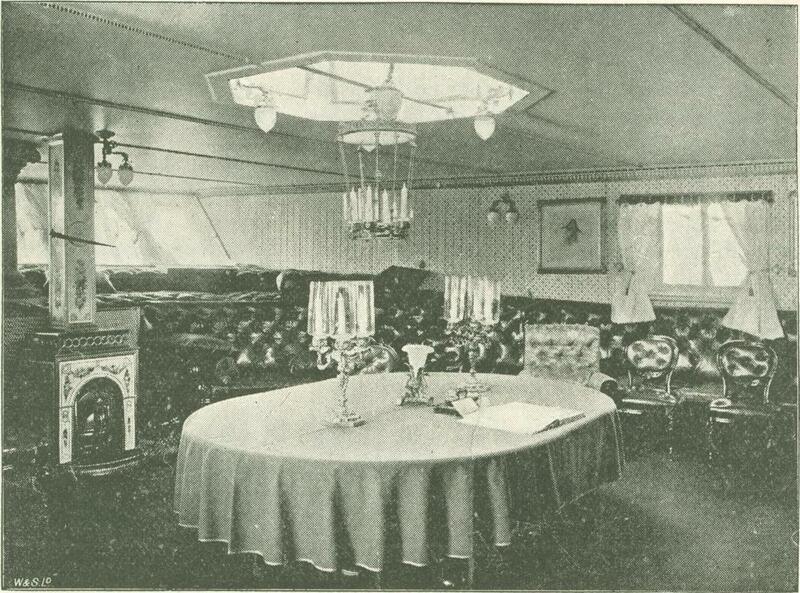 The cabin which was for­merly occupied by the Prince of Wales and Duke of Edinburgh contains two little brass bedsteads and maple furniture, decorated with the Prince of Wales’ Feathers; and the Tutor's cabin opens out of it. The pavilion, or breakfast-room, has mahogany fur­niture covered in leather, and a couple of large saddle - bag easy chairs, a very handsome painted porcelain stove, and frilled muslin curtains to all the parts. 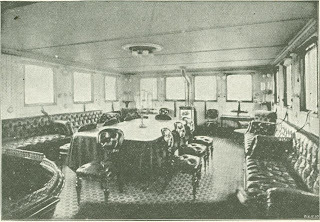 The dining-room is furnished in a similar way, but the walls are hung with charts and portraits of the former captains of the vessel, who were as follows: (t) Lord Adolphus Fitzclarence, (2) Sir Joseph Denman, (3) George Henry Seymour, C.B., (4) His Serene Highness Prince of Leiningen, (5) Captain Hugh Campbell, and (6) Captain Frank Thompson. A very handsome candelabrum is of nautical design, and the brass coal scuttle is fashioned like a nautilus shell; walls, salmon; and cornice, white and gold, in "Rose, Shamrock, and Thistle" design. Her Majesty's drawing - room is 26ft. by 18ft. 6in. The walls chintz-covered, and hung with portraits of the Royal Family in oval gilt frames, in the same design as the cornice; the furniture of bird's-eye maple; the coverings, all of chintz, to match the walls. 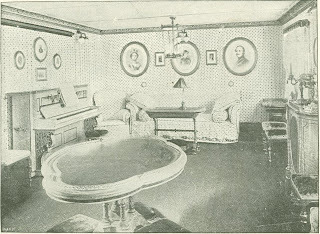 Two large sofas, one at each end of the room; two or three easy chairs, the others high-backed; an "Erard" piano, book-case and cabinet combined, writing-table, occasional tables, and an oval center table, comprise the whole of the furniture. I noticed a very handsome reading-lamp of copper and brass, for electric light, with a portable connection, so that it be used in any part of the room. The belts have also the same contrivance. The two chandeliers, for six candles each, are of the same design as the one in the dining-room. The corridor leading to the Royal apartments is hung with rich green silk damask curtains, and on the walls are water-color paintings of several of Her Majesty's ships, done by the boys of Christ's Hospital. The staircase is very wide and handsome, of maple, with gold and white balustrades. 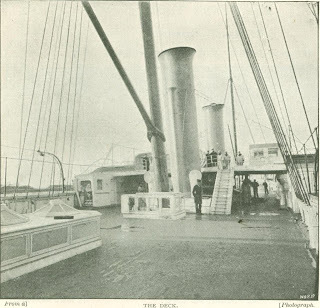 The Ladies-in­Waiting have their cabins on the star­board side in the fore part of the vessel, and the Lords on the port side; they have also a commodious dining-room, decorated in white and gold. Her Majesty's ser­vants have twelve cabins, six of them fitted up for two people. In addi­tion to these there are numerous domestic offices, a dispensary, the officers' cabins, and accommoda­tion for the crew, which numbers 170. Her Majesty the Queen is never now longer on board than forty-eight hours at a time and the vessel is kept in such perfect order that only twelve hours' notice is required to prepare her for the reception of Royalty.